The Anchorage in Upper Seagry, near Chippenham, Wiltshire sleeps 10 people. 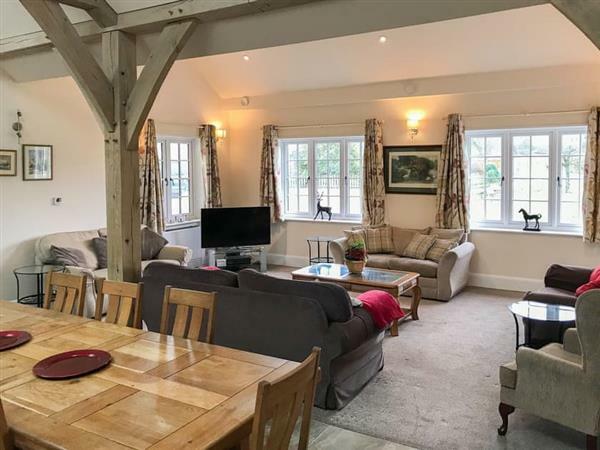 The Anchorage near Chippenham is a detached barn conversion which is the perfect base from which to explore Wiltshire, Somerset and the Cotswolds. It is situated adjacent to the owner’s home on the outskirts of the village of Upper Seagry about a mile away, with a local pub and restaurant. There is a games room with a pool table, table tennis and lots of games and books, and is great for kids of all ages. The dog friendly property is also about 4½ miles from Malmesbury, 6 miles to Chippenham and many attractions nearby which welcome dogs. Bowood House, Corsham Court, Lacock Abbey, Dyrham Park, Stourhead and Chedworth Roman Villa are all worth a visit. Cotswold Water Park is popular with the children, whilst Westonbirt Arboretum with its extensive collection of trees and shrubs, provides a pleasant day out for older members of the party. The shop is 1 mile from The Anchorage near Chippenham, with the pub and restaurant ¾ mile from The Anchorage. Games room: With pool table and table tennis. Air source heat pump central heating, electricity, bed linen, towels and Wi-Fi included. Welcome pack. Enclosed garden with sitting-out area and garden furniture. 2 dogs welcome, to be kept on a lead at all times (sheep country). Private parking for 4 cars. No smoking. Please note: There are several internal steps. Holidays at The Anchorage run from Friday to Friday. Pets allowed at The Anchorage. For a better idea of where The Anchorage is, you can see The Anchorage on the map below. You can find more large holiday cottages (that's cottages which sleep 8 or more people) in Wiltshire. If you want to see more large cottages, have a look at large cottages in Wiltshire. The Anchorage is in Wiltshire; should you be on the lookout for a special offer, you can find all the special offers in Wiltshire. It's always worth checking to see what is on offer at the moment. Do you want to holiday near The Anchorage (UK10665), you can see other cottages within 25 miles of The Anchorage; have a look to find your perfect holiday location.